Pneumatic rosin presses don’t involve any hand pumping, so they are effortless to use. Such rosin presses are especially useful if you plan to extract a few batches at a time. They are also easy to control, and their pressure can be changed as you press the product. The CA Rosin Press Pneumatic Rosin Heat Press is one of the best choices for a pneumatic rosin press on the market these days. The 8 x 6 inches dual-element heating plates are able to raise the temperature stability. The temperature readout is customizable in both Celsius and Fahrenheit degrees. 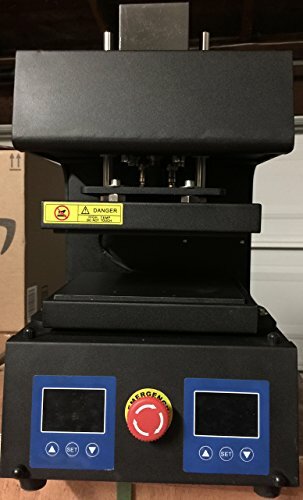 The CA Rosin Press Pneumatic Rosin Heat Press comes with a digital temperature control with dual LCD readouts from 0 to 415 degrees Fahrenheit. It’s effortless to set the temperature according to the cannabis product that you plan to press. Temperature is critical when you are working with rosin presses, and it’s also the most debated variable. When you apply pressure and heat on the flower, the consistency and the speed in which it will liquefy depend on the temperature that you use. Cold pressing involves 1 to 5 minutes of pressing the material at 160 – 190 degrees Fahrenheit and the result will be with batter consistency. Hot pressing at 190 – 220 degrees Fahrenheit involved pressing the material for about 45 seconds to three minutes, and the result will be an oily consistency. The pneumatic rosin press comes with a useful digital timer that features automatic press control. It also provides the user the ability to control it effortlessly. An air circulator is also included for increased control. It’s essential to set the digital timer correctly because this way you will prevent burning the material due to pressing it for a much too long period of time. The CA Rosin Press Pneumatic Rosin Heat Press comes with a heavy-duty pneumatic ram that is able to provide the optimum pressing force. An optimum pressing force is vital because flower rosin requires increased pressure compared to kief and hash rosin to squeeze the juice out. So, applying to much pressure can damage the material. The ideal pressure range for flower rosin in between 550 and 1,500 PSI. 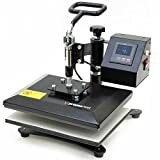 The CA Rosin Press Pneumatic Rosin Heat Press comes with an adjustable pressure that is up to 5000 PSI. You can also adjust the pressing time as well to prevent burning your cannabis material if it stays too long between the heat plates. 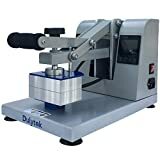 The automatic operation of the CA Rosin Press Pneumatic Rosin Heat Press provides manual safety override. 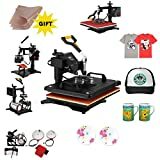 I received this Pneumatic Rosin Heat Press a few weeks ago, and it was pleasantly surprised to find a well-constructed rosin press. The machine is quite heavy, and it features easy to read knobs. I used it to extract cannabis oil seven times until now, and I can tell you that it works beautifully. An important recommendation that I can give you is to use parchment paper and to purchase a brand name like Reynolds because this is higher quality than the most paper types you’ll find on the market. If you use generic paper, it will probably burn quickly or at least that is what happened to me. Also, don’t forget to use the excellent pair of heat-resistant gloves that are included in the box. Another thing I liked about this rosin press were the really detailed instructions that helped me get the hang of this machine and get it working in no time. A friend of mine has a more massive device that costs three times more than the cost of this oil extracting one, and he keeps complaining about it. I’m pleased with this smaller model that managed to do its job correctly so far. I’m delighted with both the temperature and pressure ranges because they’re perfect for my rosin needs. I usually press flowers and dry sift keif and the final product is flawless and high-quality every time. Until now, I didn’t have any trouble while using it and I definitely recommend it to anyone who is a cannabis enthusiast like myself. 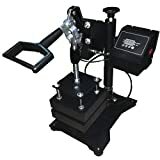 The CA Rosin Press Pneumatic Rosin Heat Press comes with a free pair of heat-resistant gloves for enhanced safety. The machine also includes digital controllers of temperature for both the top and the bottom plates. You can adjust the heating temperature to prevent burning the cannabis material. The machine is well-constructed with easy to read knobs. The CA Rosin Press Pneumatic Rosin Heat Press is also suitable for beginners who haven’t used a rosin press before. The temperature and pressure ranges are perfect for making the best flower rosin. When you use generic paper with this particular pneumatic rosin press, it seems that it burns very quickly. It’s recommended that you use parchment paper instead and then you won’t have any troubles. The CA Rosin Press Pneumatic Rosin Heat Press comes with a one-year warranty. You will also get non-stop support from the manufacturer, and you will find all the necessary parts in stock if necessary. All the units are in stock, and they are shipped directly from CA. 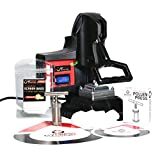 The CA Rosin Press Pneumatic Rosin Heat Press is one of the most versatile pneumatic rosin presses on the market, and it packs great features for helping you produce the highest-quality rosin. The robust pneumatic cylinder and the heating plates work flawlessly, and they save you lots of effort. This pneumatic rosin press comes with a one-year guarantee and the manufacturer also provides the best services and support. 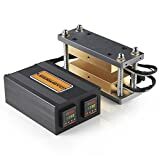 So, there’s no reason for not purchasing this pneumatic press if you prefer this kind of pressing machine to produce the best rosin without potential risks of ruining your cannabis material.